A 376-year-old, horsehide trunk that survived the 1635 shipwreck of the Angel Gabriel at Pemaquid now is on display at the Colonial Pemaquid State Historic Site museum in New Harbor. The trunk, once owned by Pemaquid colonist John Cogswell, has been loaned by the Cogswell family to the museum for display. The ship model shows what the Angel Gabriel, similar to the Mayflower that brought the Puritans to Plymouth, Mass., looked like. A 376-year-old horsehide trunk that survived a shipwreck in Colonial America — caused by one of the most terrific storms to occur along the Maine coast — now is on display at Colonial Pemaquid State Historic Site in New Harbor. John Cogswell of Buena Vista, Colo., a direct descendant of the same-named American colonist who first owned the trunk, has lent the historic artifact to the Colonial Pemaquid museum for seven years with the possibility of its becoming part of the museum’s permanent collection, according to Maine Bureau of Parks and Lands officials, under the Maine Department of Conservation. “Our family has been the guardian of the Cogswell trunk since it floated ashore at Pemaquid Point on August 15, 1635,” the most recent John Cogswell said. “We are now pleased to pass it along to the State of Maine, which has the perfect place where the public can enjoy this piece of history, including those descendants of families who came to America on the Angel Gabriel which met its fate during the hurricane which sunk it and brought the trunk to shore. “The small museum at Pemaquid Point where the trunk will now rest safely and securely is a delightful place and a credit to the people of Maine,” he said. Colonial Pemaquid is a unique Maine historic site originally a colonial fishing settlement established in the 1620s that produced and shipped cod to England. A reproduction English fort, Fort William, an 18th-century farmhouse and a museum containing rare colonial artifacts and American Indian items going back 7,000 years define the historical significance of the site, located on a sheltered coastal peninsula, to human habitat. Last year, more than 28,000 visitors explored Colonial Pemaquid, where special events also are offered by the Friends of Colonial Pemaquid. In 1635, the English galleon Angel Gabriel went to the bottom of Pemaquid Harbor in the Great Colonial Hurricane of 1635, Desjardin said. John Cogswell, a young merchant hoping to build a new life and business in the New World, had been a passenger on the Gabriel’s voyage from England and, like many of his fellow travelers, disembarked for the night while the ship anchored at the Pemaquid settlement in modern-day Bristol, Maine. The ship Mayflower brought the English Puritans to Plymouth, Mass., in 1620. Cogswell managed to recover some of his goods, mostly barrels of items he had brought on the voyage to help set up his new commercial venture, but most of his fortune was lost beneath the waves, Desjardin said. Among the wreckage of the storm, however, floated a small trunk covered with horsehide and decorated with ornate, round-headed nails including the letters “J. C.” It contained all of the personal belongings Cogswell had in the New World. Last year, a new bronze plaque commemorating the shipwreck on the 375th anniversary of the event was unveiled at Colonial Pemaquid. The latest John M. Cogswell — the sixth male of that name in the direct family line between him and his ancestor who first owned the trunk — read about the plaque and contacted Desjardin. After exchanging a few emails with the park historian, Cogswell arranged to loan the trunk to Colonial Pemaquid for seven years, with the possibility of making it a permanent donation. Cogswell also has provided an affidavit attesting to the provenance of the trunk through his family. 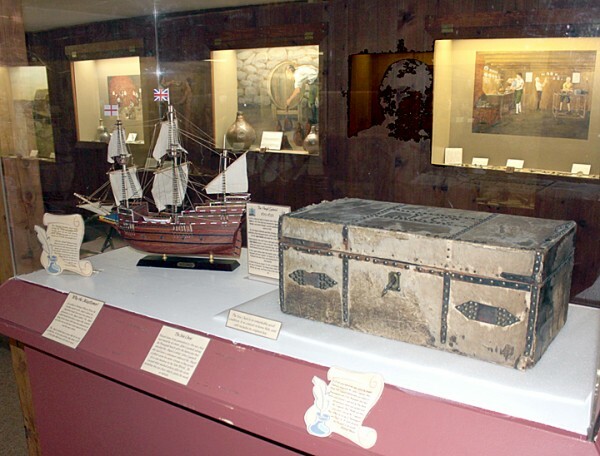 Visitors now can view the distinctive, monogrammed trunk on display at the Colonial Pemaquid museum, along with a model ship depicting how the Angel Gabriel looked. The historic plaque, embedded in a granite monument, also can be viewed on the grounds of the state historic site. For more information about Colonial Pemaquid State Historic Site, call 677-2423 or visit www.friendsofcolonialpemaquid.org.